Every organization has its own unique set of business objectives, compliance requirements, policies, procedures, and technology solutions. As a result, it also has its own unique set of threats, vulnerabilities, and risks. Traditional approaches to cyber risk management, including one-size-fits-all checklist assessments, spreadsheets, or paper-based systems, can not address the unique needs of your organization and often do not meet HIPAA Compliance requirements. Designed for healthcare, Clearwater’s Enterprise Cyber Risk Management Solution (ECRMS) provides full visibility into where your greatest exposures lie. Unlike antiquated spreadsheet-based assessments, our IRM|Pro™ Software as a Service (SaaS) is designed to adapt dynamically to your organization’s specific systems and processes out of the box. In addition to facilitating the ongoing enterprise-wide evaluation of threats to your information systems, we enable you to effectively manage risk remediation actions, thereby improving your security posture. 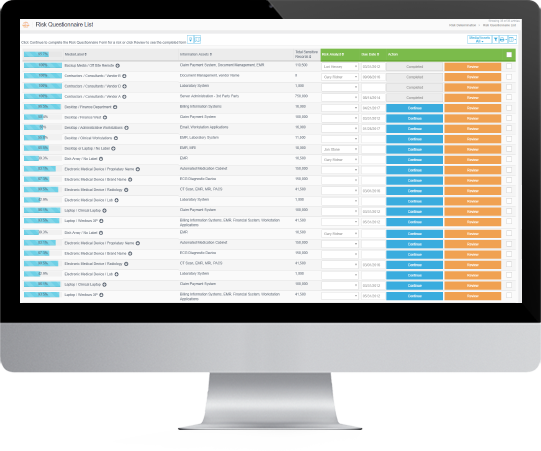 Our industry-leading ECRM Solution for healthcare, complete with our IRM|Pro™ software, manages all of your risk analysis and risk response needs. We create best-in-class OCR-Quality™ risk analyses for hospitals, health systems, and their partners that evaluate the threats to all information systems, in all locations, including assessing the likelihood and impact of a breach. Stay ahead. Vulnerability and threat scenarios are updated by Clearwater on an on-going basis. Increase efficiency with a streamlined, automated risk analysis and risk management process—no more spreadsheets! Learn about our OCR Enforcement Assistance, Strategic Security Roadmap, and more. Based on all I’ve seen over the years, Clearwater’s risk analysis methodology and software are in the best-of-breed tier and can be seriously considered by any organization striving to meet regulatory requirements in performing HIPAA risk analysis. Conducting an enterprise-wide, information system-based HIPAA risk analysis that adheres to OCR’s guidance and provides full visibility into your organization’s exposures is no small task. A by-the-book approach to HIPAA risk analysis can be overwhelming unless you have the right tools and resources in place. Clearwater provides the most comprehensive NIST-based Security Risk Analysis solution available. Powered by IRM|Analysis™, our solution has a 100% acceptance rate from the OCR. 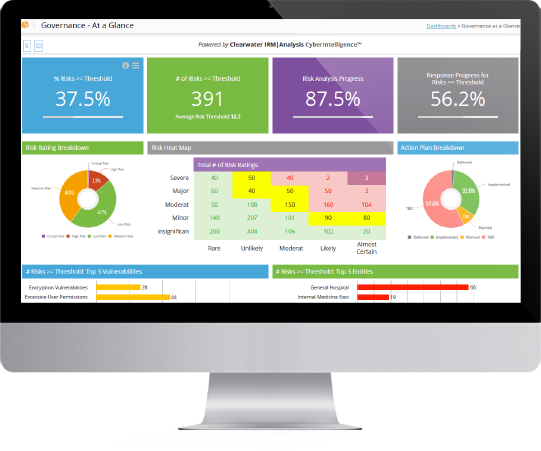 Our HIPAA Risk Analysis solution combines our proven methodology with our proprietary IRM|Analysis™ SaaS platform to deliver the most comprehensive risk analysis available. Clearwater’s risk analysis solution maps to the specific systems and processes in your organization and gauges risks based on the likelihood of a threat exploiting a vulnerability and the resulting impact to your organization. 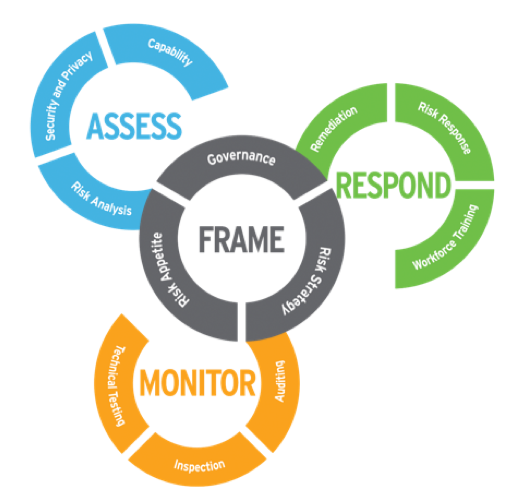 Rely on our expertise and systematic approach to conduct an OCR-Quality™ enterprise risk analysis. Be Clear. Be Confident. Be Thorough. Risk response is part of the ongoing process of managing risks identified during risk analysis and is a key step in the overall NIST Risk Management Process. Risk response should be conducted in a methodological manner with adequate identification of owners, alternatives considered, documented decisions, and implementation planning, as required under the HIPAA Security Rule. Clearwater employs a proprietary methodology based on years of experience working with clients to create OCR-Quality™ responses that deliver results. We leverage our OCR-Quality™ risk analysis—populated in our IRM|Analysis™ software—and our professional services team to manage the entire process based on our careful study of the explicit HHS/OCR guidance and NIST SP 800-39 – Managing Information Security Risk. Hospital leaders tell us there is a lack of skills, knowledge, experience, and funding to stand up, operate, and maintain an effective cyber risk management program that will protect patient information, ensure patient safety, and safeguard a hospital’s finances and reputation. Conducting an OCR-Quality™ Technical Evaluation required by 45 CFR §164.308(a)(8) helps organizations test the effectiveness of the controls they’ve implemented and meet the explicit HIPAA Security Rule requirements for periodic technical evaluation. Information security risk management has been a long-standing requirement in healthcare privacy and security regulations. However, compliance with regulations does not necessarily imply an organization has a secure information systems environment. Lead. Establish. Implement. Mature. Improve. A completely tailorable service based on your own compliance and cyber risk management requirements. A service that comes complete with our SaaS-based, IRM|Analysis™ to help create an OCR-Quality™ risk analysis. Services can be delivered both on-site and remotely. Let Clearwater augment or fill your security and risk management staffing requirements with knowledgeable, experienced individuals to help you achieve your compliance and cyber risk management program goals. We can provide program leadership and advisory services, formalize information risk management program governance, and develop security and information risk management policies and procedures as required. Third-party cybersecurity risks are increasing in intensity and complexity threatening the critical data you entrust to your business associates. Clearwater can establish or strengthen your business associate risk management program helping you obtain the assurance you need that your BAs are safeguarding the information entrusted to them in order to reduce the risk of reputational and financial repercussions to your organization. Our 3-Phase Risk Management Process begins with a complete inventory of your BAs and their agreements. Phase two identifies high-risk business associates (BAs), distributes attestation questionnaires, and determines follow-up actions. Phase Three updates executives and your Board through a Findings, Observations, and Recommendations (FOR) report. Where Do You Stand? What to Do Next? Find out where you stand and get a clear plan of action with our tactical assessment of your current HIPAA compliance and cyber risk management program. 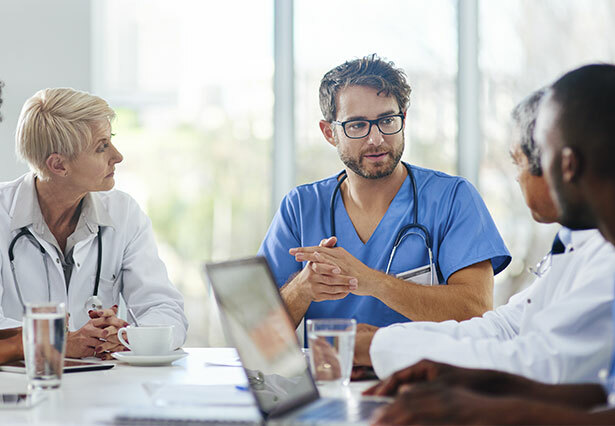 Meet the challenges of increasing interoperability and data-sharing while being confident that your organization is following HIPAA regulations. Unauthorized access to biomedical devices may not only threaten confidentiality of ePHI, but could also compromise availability of service and integrity of data critical to patient care. Assess cybersecurity before closing on any investment to avoid financial penalties or possible negative media exposure. Identify key cyber risks, security, and compliance gaps that could impact your investment. Designed for private equity firms, law firms, and healthcare organizations that are involved in M&A transactions of healthcare entities. Clearwater conducts an efficient evaluation of cybersecurity and HIPAA Compliance risk of the target investment and provides options to match your budget, timing, and scope, as appropriate. In as little as 30 days we deliver an Investment Committee-ready report and identify specific actions that can be taken to resolve critical risks. What If OCR Contacts Us? To date, there have been more than 64 Office for Civil Rights enforcement actions. Eighty-nine percent of those enforcement actions relating to ePHI included adverse findings in an organizations’ risk analysis and risk management. Clearwater-provided risk analyses have a 100% acceptance rate when submitted to OCR.